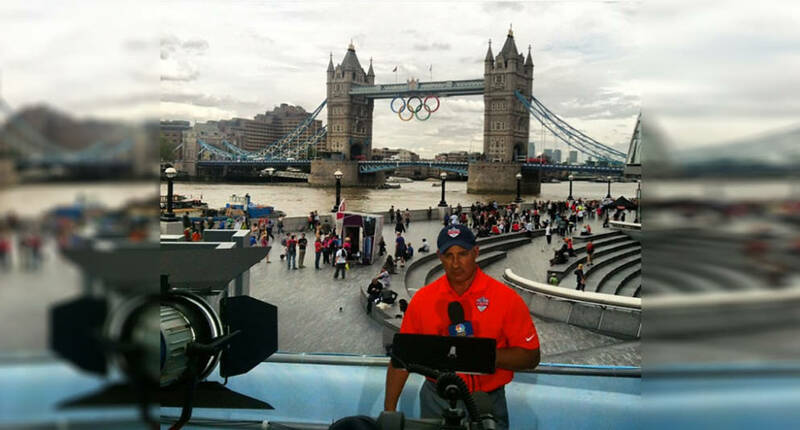 With the 2016 Summer Olympics kicking off on August 5, we decided to talk to Jim Cantore about his experience with the games. He has covered the Olympics twice, Vancouver 2010 and London 2012, and gave us insights on the energetic atmosphere, what event he would do best in, and of course, the impact of the weather. Q: What was it like covering the Olympics? A: I covered the Vancouver 2010 Olympics and the London 2012 Olympics. Both of these locations were high weather impact areas. In 2010, we didn’t know how warm it was going to be in Vancouver. They certainly didn’t plan on the warm winter that they had. If you remember, they had to helicopter in snow and deal with snow melting. In 2012, we thought rain was going to be a huge factor in London, but that didn’t end up being the case. In terms of Rio, I think they have more issues with a lot of the aesthetics and ancillary services more than weather, which are big deals. Take the water for example. Is it even safe to drink? You’ve got athletes who are going to be spending time in some of this water that in our country would probably be quarantined. Those are huge issues. Zika wasn’t a factor when they elected Rio to be the Olympic city for 2016. There are a lot of challenges that are away from the weather. Q: What’s the atmosphere like at the games? A: It’s pure energy. It’s a month long party. People get in the spirit. They are in their country, and they are hosting the world. It’s a once in a lifetime experience. The energy that surrounds the Olympics especially in the home country is just incredible. Q: Do you have a memorable moment from covering the Olympics? A: The stuff that NBC Sports let me do with Al Michaels was just fantastic. The production value NBC Sports puts into covering the Olympics is absolutely incredible. You go there and it’s kind of like you’re going to battle for three and a half weeks. They need every minute of your time to really dedicate to the broadcast as they are bringing world the finest gathering of athletes in the world. Q: What’s your favorite event to watch? A: I love the super giant slalom. It takes incredible strength. It’s unbelievable. I also love the half-pipe. It’s a crowd thriller. These kids are doing awesome stunts on their snowboard. When you throw in a new Olympic event that’s really popular in culture it becomes this wild ride. I love watching the snowboarding competitions. I like outdoor events in the winter Olympics, but I actually like watching the indoor events for the summer Olympics like swimming and gymnastics. Q: If you could compete in the Olympics, what event would it be in? A: Bobsledding. I’ve got some powerful legs, and I can get compact. I think that’d be my best shot. Q: Do you think weather affects the summer or winter Olympics more? A: From what I’ve seen in the Olympics, I would say the winter games because without snow and cold you’re out of luck. There are also more outdoor events in the winter Olympics. If you look at the last two winter Olympics, they’ve been held in almost subtropical climates. We’ve had average temperatures around 50 degrees making for two of the warmest winter Olympics we’ve ever had. But they prepared for those conditions and they went off without a hitch. Q: What summer event is most affected by weather? A: Sailing, rowing – anything that’s out on a body of water. If you get choppy waters, thunderstorms or lightning you can really get hammered out there. Even archery – the slightest wind and humidity can throw them off. Q: Zika is obviously a big concern for the athletes and spectators. What impact does the summer weather have on mosquitoes and the disease? A: It’s more standing water that holds the threat. It’s a dangerous game we are playing down there because we really don’t know everything about it. Also, since the virus is sexually transmitted it creates a large threat considering Olympic Village history. If people get infected down there they could bring it back to their countries, and the virus could run rampant. It should be a huge concern. It will be an interesting story to follow after the Olympics. Q: How does the climate of Rio compare to past summer Olympics and how would those changes affect training/performance? A: This is the first Olympics held in South America, and they are actually in their winter going towards spring. I think it’s going to be very pleasant weather wise. It’s not in the middle of summer. It’s a tropical winter – kind of the equivalent of being in Florida. It will be what we consider very nice fall weather in most of the states. Do you have any thoughts on how the weather will impact the Olympics? Want to share any fun Olympic stories of your own? Comment below or start a new discussion in the Community Forum! I also like jim Cantore and Mike Siedell. Why no coverage of Prescott,Az on Weather Channel Tv? If “withstanding hurricane force winds” was an Olympic event, Jim would be the Gold Medal winner! I remember when I first saw Jim. He was chained to the floor while standing in front of a wind machine replicating hurricane force winds. After that, I decided to name him Dr. Doom. Jim seems to always be where the weather is extreme form Hurricanes to floods. P.S. I am sure Jim Cantore would do best in some swimming event as he had to slosh through and swim around the waters in New York City in the hurricane waters and floods of Hurricane Sandy in 2012. ! !